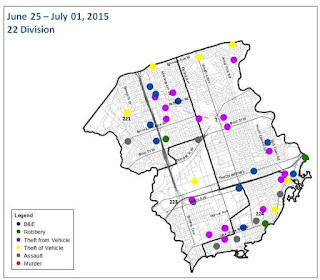 The officers at 22 Division have been publishing weekly crime statistics on their Facebook page. These maps provide a good indicator of the crime trends in our area and other surrounding communities. Police Disclaimer: Valid at the time it was produced. Some of these stats are subject to change. Users should not rely on the information or data provided herein for comparison purposes over time, or for any reason.